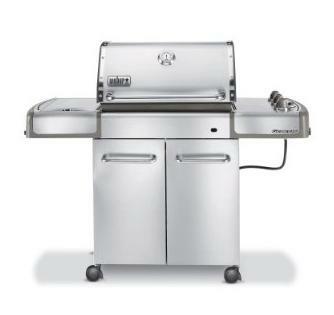 Fans of quality gas grills have an amazing deal on their hands. You can save $228 (22%) on a Weber 3770001 Genesis S-310 Propane Gas Grill at Amazon, with free fast shipping if bought straight from Amazon. The Weber comes disassembled, but putting it together takes 30-60 minutes and gives you a true appreciation for the construction of this gas grill. No cheap plastic, this is a stainless steel gas grill. It even has a precision fuel gauge so you know how much time you have before you refuel. If the perfect reviews at Amazon are not enough, this Weber grill has lasted at #1 on Consumer Reports for some time. The Weber 3770001 heats up too 600+ degrees really fast. More importantly, the construction of the Weber shows in it’s performance as far as even cooking is concerned. Most grills have heating elements that run front to back, leaving it warmer in the back of the grill. But since this Weber grill runs left to right, it means that the heat is distributed much more efficiently, thus your food will cook much more evenly. This also enables you to cook indirectly with better results. You may find some Weber Genesis Gas Grills on eBay for under 800$, but shipping this grill is upwards of 100$. That’s why Amazon’s free shipping is a life saver for the Weber Genesis 3770001 Gas Grill, making it a flat rate of 820$ instead of the 1049$ it used to be. Weber grills for me are the most reliable. I have no regrets buying those for our grilling needs.